George Dorgan shows that Gross Domestic Product (GDP) is a measurement in the local currency. Effectively, Swiss real GDP rose by 15% in Euro terms, but fell slightly in CHF. He also emphasizes that Switzerland needs a big rebalancing of its economy, away from exports towards consumption. The Swiss National Bank was right to remove the euro peg. The move towards consumption is only possible when the Swiss franc is stronger because consumers will profit on it. Right after the end of the peg, the region head for Switzerland and Austria of a big Japanese-Swedish mobile phone producer contacted me. He said that the budget for this year was already spoken for. But with the revaluation of the Swiss franc by 15%, the costs in yen for his region had risen by 15%. Since 12 people were working for him in Switzerland, one person had to go, and that was logically him, the captain. I explained to him that Swiss revenue will increase by 15% in yen terms, too, hence the margin will remain the same – apart from sales in the Euro-country Austria. He was reluctant to believe, he thought that many Swiss would lose their jobs and stop buying his phones. Now it is June, he still has his job and he told me that sales figures are developing nicely. In recent days, Swiss mainstream papers started a second round of SNB bashing. Bilanz speaks about the recession that is looming, not only for the first quarter but for the whole year. But let’s take a look at the GDP details based on the SECO estimate: as a basis we will use the EUR/CHF exchange rate at the end of Q1 of 1.0437, the franc is 15% higher than the 1.20 “minimum rate”. In Euro terms this is a rise by 16%: 15.4% for the existing GDP and 0.6% in Euro terms for the 0.5% increase in CHF. This reflects the fact that GDP is a quantity measurement. Most economists use Y for the quantity output, but this ignores that the currency is an implicit part of the GDP measurement. The numerator of real GDP, the GDP deflator was somewhat lower this time, because many imported goods got cheaper. This helped real GDP to climb. As opposed to the currency, price developments, often called “inflation”, are excluded from real GDP. For the country head of our initial discussion, it implies that sales in Swiss francs would be up by 0.5% and – thanks to the falling yen – by nearly 20% in yen terms. The main component of the internal economy, consumption, makes up 65% of the Swiss GDP. This is clearly less than the 83% for the United States and the 77% of the “export nation” Germany. In Euro terms this is again a rise by 16%. After years of strong gains, Swiss goods exports finally slowed down. The difference between exports and imports, so-called “net exports” or the “trade surplus”, has finally fallen. This also implies that the ratio of consumption against GDP is finally rising again from the lows of 65%. This tendency is also visible in services, but to a lesser extent. 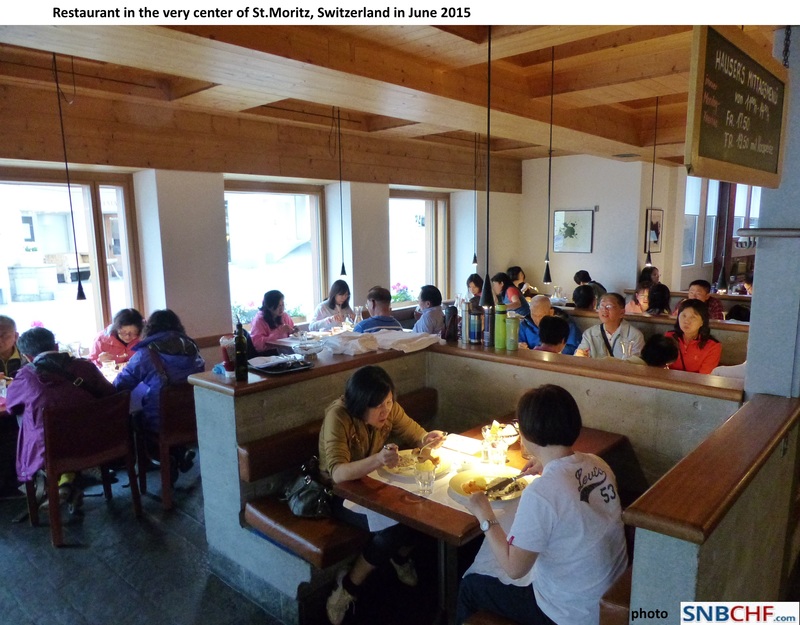 No wonder, the Chinese Yuan was also stronger, as visible in this picture from one of the biggest hotels and restaurants in St. Moritz. Some Swiss hotels have already started paying their employees in euros. “Many categories on the production side reported a marked slowdown.” and then the SECO starts a longer discussion of how badly the manufacturing sector behaved. Most readers know that we have criticized GDP as a not very useful conglomerate of consumption (one would say 83% in the U.S. case and 65% in the Swiss case) and production-related activities (17% for the U.S. and 35% for the Swiss and more than 50% for China). The most production-related activities are investments and net exports. Michael Pettis wrote in his book about the big Chinese rebalancing that China needs to consume more and reduce the investment part of GDP. If Switzerland wants to avoid a bankruptcy of its central bank, then Switzerland also needs a big rebalancing: away from the export-related activities to more consumption. The most recent CPI increased by 0.2%. Higher prices imply that the profit margins of Swiss companies remain strong. Gains in import prices are not transferred enough to the consumers and consequently they do not spend enough. When we look at the graph above, we see that the first big Swiss rebalancing happened between 1975 and 1978, when consumption to GDP rose from 64% to 72%. Not coincidentally, this was the period when foreigners had to leave Switzerland. 1978 was also the year when the SNB established the first minimum exchange rate against the German Mark, and they won it thanks to rising consumption and falling exports. But nowadays, net immigration to Switzerland is still 1% per year. This cheap labor further sustains the profit margins of Swiss firms. 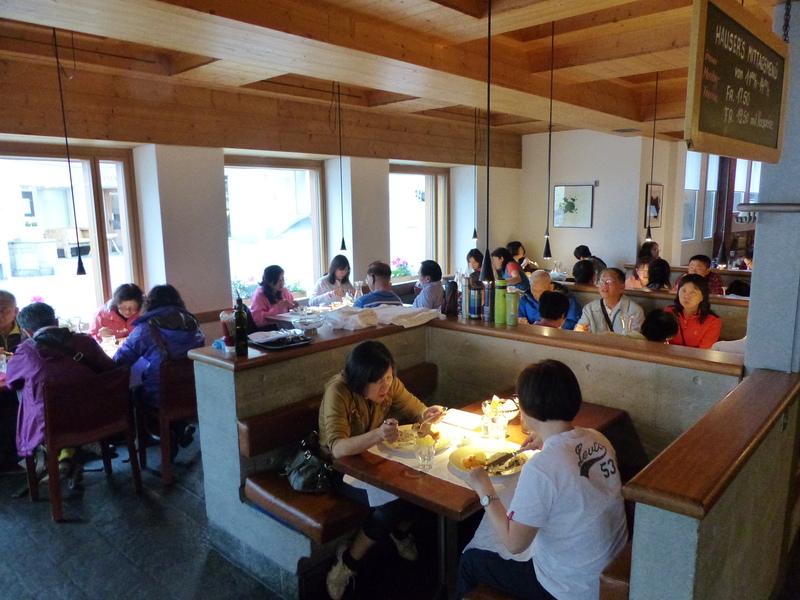 Fortunately Swiss tourism has already started the rebalancing: According to Swiss Statistics, booked nights rose by 1.9% for Swiss guests, by they fell by 1.4% for foreign guests in the six winter months. With rising profits of Swiss companies, inflows in CHF-denominated assets will remain strong, and also the Swiss franc. The situation of the Swiss National Bank will remain difficult, to remain solvent is a major challenge.